James Balmain is the founder of Webtogs, a new outdoor equipment and clothing retailer that’s set to launch a shop and very professional looking site in the autumn. We asked James, who has little previous retail experience, how the Webtogs team is coping with the various challenges of launching an e-commerce start-up, especially in a sector that’s not as web-savvy as others. How are things going and how far do you think you are away from going live? That’s the one question that anyone trying to set up an e-product doesn’t like to be asked! We’ve been looking at September 15th but I think I just saw a giant pig flying past my office! We’ve made some really good progress though – we have various strands of work going on. All the core elements are done now, like the product displays, shopping basket and so on. As you’re opening a shop and website, how applicable do you think the multi-channel model is to your market? And what are you doing to integrate the two channels? We always thought that clicks and mortar was the way to go. We will be opening our first shop on the 15th of September. It’s 800 sq. ft. in Blandford Forum, down in Dorset. There are a lot of brands looking to push outdoor clothing and equipment in the South West, but not many retailers, as these tend to be concentrated around London and the North. In our space, for our competitors, the website typically only tends to be around 10% of the pie. They tend to be independents with three or four stores and great customer service, but they don’t know anything about the web. But it’s very difficult to criticise them for having a crap website, as it’s not what they do and many don’t have the budget. For us, going e-only was interesting, but I don’t think anybody has yet got the synergy right between online and offline. I think that the market will change in the next three or four years and the whole clicks and mortar strategy will be more robust than e-only or offline only. For us, it will give us a bit of traction. Hopefully the design of the site will give people comfort when looking at us as a new retail brand. Having the shop will also be comforting. People will know we’re not operating from a back bedroom somewhere. Also, the web will drive customers to the shop and the shop will drive customers to the web, but that model won’t necessarily work when we only have one shop. The model will work in five years’ time, when let’s say we have five or ten shops dotted around the South West. We have looked at a ‘reserve and collect’ strategy, using the stores as pick up points, but again this makes more sense when we have a bigger geographical network of stores. We’re taking a very organic approach to it all – we’re prepared to try things out and see how they do. There might be something that we all thought would be a complete waste of time but turns out to the Holy Grail. Watch this space. Hopefully I won’t be asking “do you want fries with that” in a few years! What’s your reception been like from suppliers? Do you have any tips for other etail start-ups when speaking to them? Obviously I have to be very careful about how I answer this question – without suppliers we’re screwed. Going into outdoor is not like going out there to sell plasma TVs and digital cameras. There are a few of the bigger brands rolling out things like SAP in the next year, which will help us. But some are still very wary of web traders, because they still think they are just about offering stupid price discounts. Getting a supplier in the early days was incredibly difficult – nobody wanted to know, especially with us having a name like Webtogs. But we were in B2B for ten years and you learn to be resilient. You have to find ways round it and get in front of them. Once you get to sit down with them and get to explain what you are about, it’s a completely different story. We’ve ended up meeting quite a few managing directors of outdoor brands, because no one is trying to do what we are doing in this sector. Generally, they are pretty nervous about the internet, but the fact that we are opening a shop as well makes them a lot more comfortable. On things like just-in-time delivery, where in effect they are taking the stock risk, we’ve been doing bespoke deals with each brand. We are forward ordering all of our clothing, because no supplier will take a punt on that. But on things with longer life-spans, like sleeping bags or packs, some of them are interested. Do any of them have specific systems in place to deal with web retailers? None of the ones that we have talked to have that at the moment, but it will change in two or three years. Some of the bigger brands are putting SAP in and some are talking about providing XML feeds. I think the brands in general need to get on board with the internet as a serious channel, before they commit to providing these kinds of enhancements. From your blog, it’s clear you’ve been doing a lot of thinking about the design and positioning of your shopping baskets on the site, something that can obviously have a big influence on conversion. What have you learned? It really struck me while writing that post what an important feature shopping baskets are. It was interesting to write, because there are lots of places on the web where you can get theoretical information about baskets, but there’s very little about what it’s like to actually design and build one. Laying them out, coding and designing them is not covered anywhere near as widely as the best practice side of things. One of the things we’re going to do, when we have some traffic to play with, is take a bit of a Darwinian approach and split the traffic in two. We call it our ‘natural selection’ approach. We’ll have two front end versions of the site then filter the traffic down each route. There will be the same products and the same prices, but very slight differences like differently coloured checkout buttons or changes in position. Over time, the fittest version of the site should prevail. At least, that’s the theory! We could almost do that indefinitely – you need to constantly be looking at how you can make your site better. Even tiny elements like the colour of a button can make a 0.2% difference to conversion. If you are us that’s £4.99, but if you are Amazon that’s millions of dollars. There are quite a few core areas we can study like that, in terms of the feature set. There’s the view users are given when they arrive on the site, the delivery options, and there’s a huge number of variants with the different stages of the checkout. But it’s not something I see us doing until we have a decent amount of traffic. What are you doing to overcome the challenge of selling some fairly specialist products? We’ve spent a lot of time on how we will display the products. We’re going to be using multi-angle photography, as well as some video and potentially some 3D animation. With something simple like a shirt, I don’t see animation being that relevant, but a more complex, high-end backpack could be well represented by a 3D animated model. Video could also potentially be quite useful and we will be doing a lot of it. It’s a great way to get over the fact that you can’t pick stuff up and touch it online. We think online retail is about making it worthwhile for you to buy a product online, even though you can’t touch it, feel it or smell it. The one thing that’s great about going shopping – although it is often a pretty miserable experience – is you can do that. In my mind, you have to make it a pleasurable experience. If you want a £150 pair of walking boots to go trekking in the Himalayas for three months but you’re worried about size, we could send you three pairs. Send two back and we’ll pay for the delivery. It doesn’t cost us much – the courier will charge us £3 if there are three pairs or one, so we’re just paying the return fee. It will cost us an extra £3 and we’ll get a £150 sale. Also, that customer will be telling everyone how super-cool we are. The average lead time for online delivery is 14 days in the outdoor industry, and that’s the same for a lot of other non-mainstream market sectors. We’ll come along and our average lead time will be 48 hours. In e-commerce, it’s very easy to forget that there is this entire area of logistics and warehousing. When we did our first project plan, just over a year ago, we split the business into three distinct sections. The first was how we got people to our site, the second was their experience when on the site, and the third was everything after the purchase. We ended up deciding that each bit was as important as the other. Time will tell whether we are right, but we think the time after a customer presses the ‘Confirm Order’ button is massively important, far more important than the latest Ajax form widget. Are you thinking about displaying user reviews, perhaps from a third party provider? Yes, I think they’re critically important. Writing a review engine is a relatively simple process, but the issue for us, as a start-up, is that you don’t have enough traffic and traction to get people to review stuff. In our case, we’re opting for a third party provider and we’re really steering towards Reevoo. They seem particularly keen to get high-converting sites; niche areas where there is still a sizeable market. What testing are you planning to do before launch? Just recently, we’ve done a tiny pre-alpha release, which is just about products and how we display them. The next one, in about three weeks, will be alpha and will effectively involve a live site and looking at whether it works across all platforms properly. After that will be beta, but with a closed user group of about 120 people. We’re also going down to Bournemouth University – we have arranged a class of 27 digital media students to test a live version of the site. We’ll give them different scenarios, different products to look for, and track them on the site. It’s of limited use, but it’s also quite valuable because you can constrain it, it’s quite time-effective and we can filter out the age spread, focusing on one demographic, giving a higher statistically relevant set of results. As you’re introducing some Ajax into the site, how do you think it can be best applied by etailers? Before we started doing Webtogs, we were in the software development agency space and were heavily focused on the web. Our attitude was always that we were very technology independent. You just use the best tools for the job. We’re just using it where we think it is warranted. For example, parts of our navigation system on the left will be Ajax and we’ve used it quite extensively in the log-in process. For forms, Ajax is particularly good. We’re also using it extensively to perform real time stock checks. This affects our product pages, shopping basket and checkout, for variables like size and colour. Actually, thinking about it, we’ve used it a fair bit. Hopefully we’ve used it where it’s warranted. Pure-play web retailers are ahead of their multi-channel competitors when it comes to customer satisfaction, according to a new study. Etail solution provider Pangora surveyed hundreds of UK online customers about their experiences of delivery, site quality and customer service, and firms with no high street presence came top in most categories. 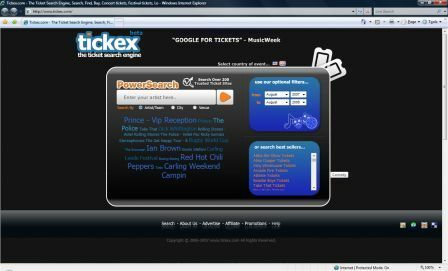 TickEx, the UK-based vertical search engine for live events, has expanded across the Atlantic by opening an office in California. The company, which launched a beta version of its site in the UK in June, says its US version will have 5m tickets in its index when it goes live. French start-up Zlio, which allows you to create and stock your own online store, has announced a CPC partnership with price comparison site Shopping.com. The deal will allow Zlio’s shopkeepers to earn commission every time someone clicks through to a product on the comparison site, while Shopping.com will benefit from the leads generated by Zlio users.